I came across the Zafiro icon theme on the social media. The icon theme was mentioned. 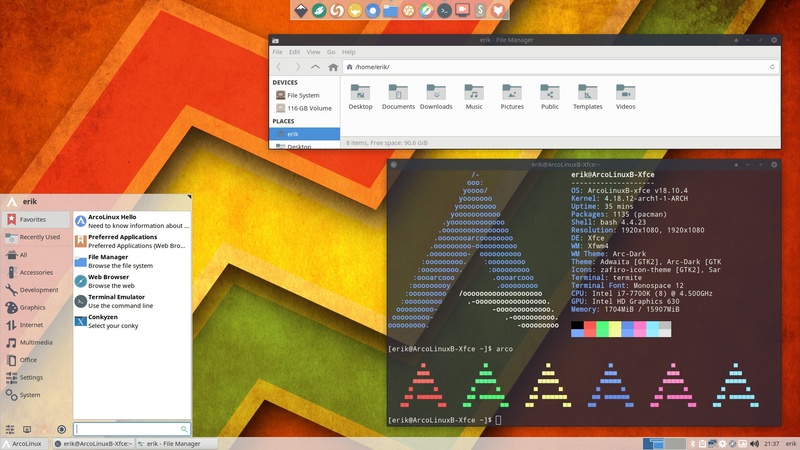 As an Arch Linux user the first thing you do …. is check … is it on the AUR? It is on the AUR! Let us use this icon theme to demonstrate the power of the inherits line. Select the Zafiro icon them. Choose a theme that goes with this icon theme. Some of your applications will not have an icon from Zafiro. It will get an icon from gnome or hicolor or numix or … This is set in the inherits line. First let us run the hardcoded icons applications in xfce settings (or in the terminal). Let us change the inherits line in the index.theme of Zafiro and rethink the order. Let us put Surfn as the first one. This can be an alternative you like better. We need to recreate the icon-theme.cache with gtk-update-icon-cache. Now we can select the Zafiro icon theme again. We combine in this video also how to update ArcoLinux. It just takes a few commands to stay roling. This PKGBUILD is changed to have more support from other icon themes. pkgdesc="A icon pack flat with light colors." Copy/paste the PKGBUILD code into a file with the name PKGBUILD. You get the resulting application in this folder with extension tar.xz. Double-click to install or pacman -U …tar.xz.